Newly empowered House Democrats faced their first big oversight test Friday when Matthew Whitaker came to Capitol Hill for a six hour grilling. 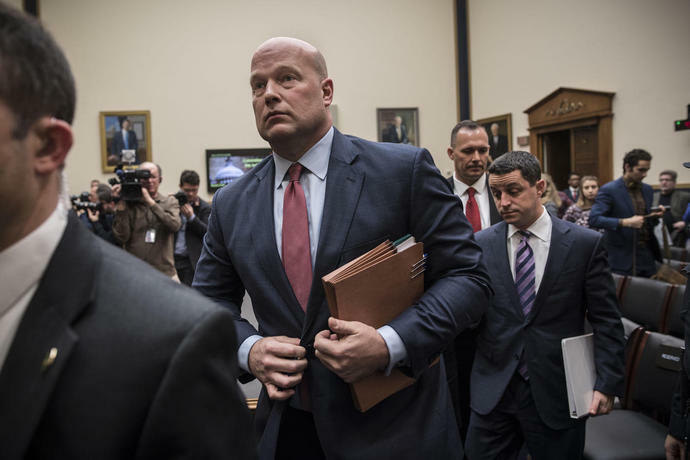 The Acting Attorney General's sworn testimony was the first time an official from the Trump Administration had come before the new Congress in a public setting. And Democrats made no bones about letting him know they were in charge now. "Your failure to respond fully to our questions here today in no way limits the ability of this Committee to get the answers in the long run - even if you are a private citizen when we finally learn the truth," Judiciary Committee chairman Rep. Jerrold Nadler reminded Whitaker in his opening statement. As expected, tensions were high throughout the nearly six-hour hearing. Barbs were thrown; questions, dodged. But those conducting - and watching - did glean some new information. Most notably, Whitaker said under oath he had never spoken with President Trump about Special Counsel Robert Mueller's investigation, nor had he interfered in it; he said he chose not to recuse himself from overseeing that probe; and that he had never denied any funding to the investigation. But there were several questions he did not answer. He declined to say, for instance, whether he had discussed other ongoing investigations with the President, like the one in the Southern District of New York, and whether he deemed Mueller's probe a "witch hunt," a term the President has used several times. Its likely too early to discern the implications of these revelations. As Whitaker noted several times during his nearly six hour long hearing, he doesn't have much time left in his role. The Senate is slated to vote next week on William Barr, who President Trump nominated to permanently replace Whitaker's predecessor Jeff Sessions. Barr is widely expected to be confirmed. But Whitaker's appointment has always been a test for how Democrats will use their newfound majority to flex their oversight muscles. President Trump's decision to replace Sessions with Whitaker was always controversial, and not just because Sessions, who had recused himself from overseeing Special Counsel Robert Mueller's probe, was forced out. Before he became Sessions' Chief of Staff, Whitaker argued Mueller was close to overstepping his boundaries. He also tweeted that an article referring to the probe as a lynch mob was "worth a read." He also has longstanding ties to Sam Clovis, the Trump campaign's national co-chairman in the 2016 election who said Mueller had questioned him; in 2014, he chaired Clovis' campaign for Iowa State Treasurer. Trump also announced Whitaker would be appointed as acting Attorney General the day after Democrats officially won the House of Representatives. They immediately sprung into action, sending letters mandating officials preserving documents and getting Whitaker to agree to this hearing. It was an early chance to show how they would conduct oversight of the Administration. Until Friday, it was not clear-cut how this power would explicitly manifest itself. Within just minutes of the hearing though, it became very apparent. After Nadler's opening statement - in which he also criticized Whitaker's decision not recuse himself from overseeing the Mueller investigation. In an unheard of move for a witness at a congressional hearing, Whitaker tried to chastise him when he asked if he had ever approved any request from Special Counsel Robert Mueller. "Mr. Chairman," he said, "I see that your five minutes is up." Nadler cracked a smile, but he was unfazed. "Answer the question please," he said. Whitaker ultimately said he had not interfered in the investigation. When Whitaker seemingly tried to joke about timing with another Democratic committee member, Rep. Sheila Jackson Lee, she was having none of it. "Mr. Attorney General, we're not joking here, and your humor is not acceptable," she said. "It's shocking how nervous and unsure of himself Whitaker appears to be," Renato Mariotti, a former federal prosecutor, wrote in an e-mail to TIME. "Given reports that Whitaker had engaged in extensive preparation, including mock questioning, I figured he would be armed with prepared responses to the questions he has been asked so far, which he should have anticipated in advance." There were other ways that Democrats' power was on display. Republicans on the committee, incensed by what Rep. Doug Collins, the ranking member, said was a "character assassination," first tried to adjourn the hearing, and then attempted to limit the scope of the questions. They were voted down every time, vastly outnumbered by Democrats. The hours preceding the actual hearings had all the hallmarks of the drama political observers predicted in the battle between the White House and the Democratic-controlled House that will define the next two years. On Thursday, Democrats on the committee marked up a subpoena for possible use to compel his cooperation. Whitaker promptly responded by saying he would not attend the hearing if the subpoena was used. Nadler ultimately backed down on the subpoena threat for the time being. But on Friday, before concluding the hearing, Nadler made clear that option was still on the table. The committee, he said, still needed answers from Whitaker on several fronts, including his communication with the President after his briefings on Mueller's probe and the exact dates of those briefings. "I fully intend to call you back for an interview, under subpoena if necessary," Nadler said. "And I expect more fulsome answers at that time."